OOPS ALV Reports in ABAP. Create an ALV report using CL_GUI_ALV_GRID · Prakash – 01/18/ Display Setting in ALV using CL_SALV_TABLE. The ALV is developed using OOPS and various styles are given for * *& each * Apppending the data to the internal table of ALV output LOOP AT it_table INTO. 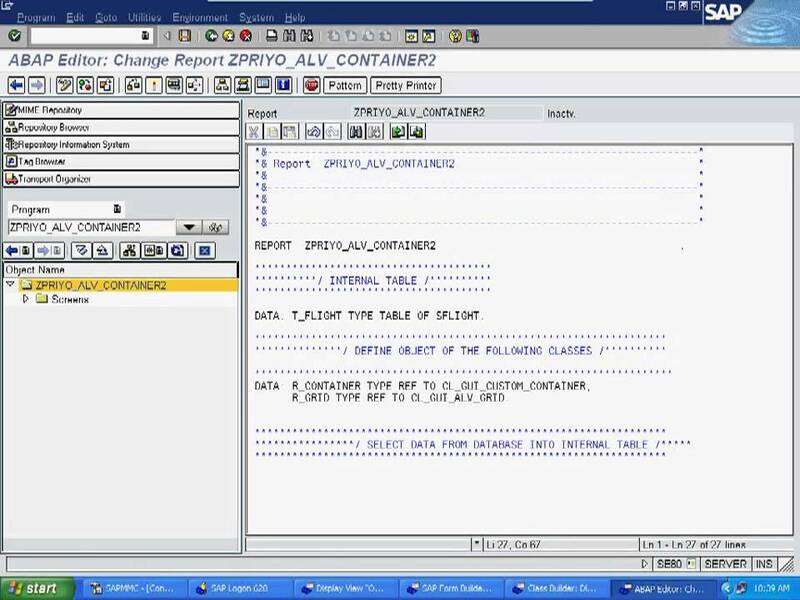 SAP ALV tool is used to make interactive OOPs concept,ABAP List Viewer enhance the readability and functionality of any ABAP report output. I hope this answered your query. Pass the width as required. Declare reference of various classes Step — III: In PBO of output Screen. 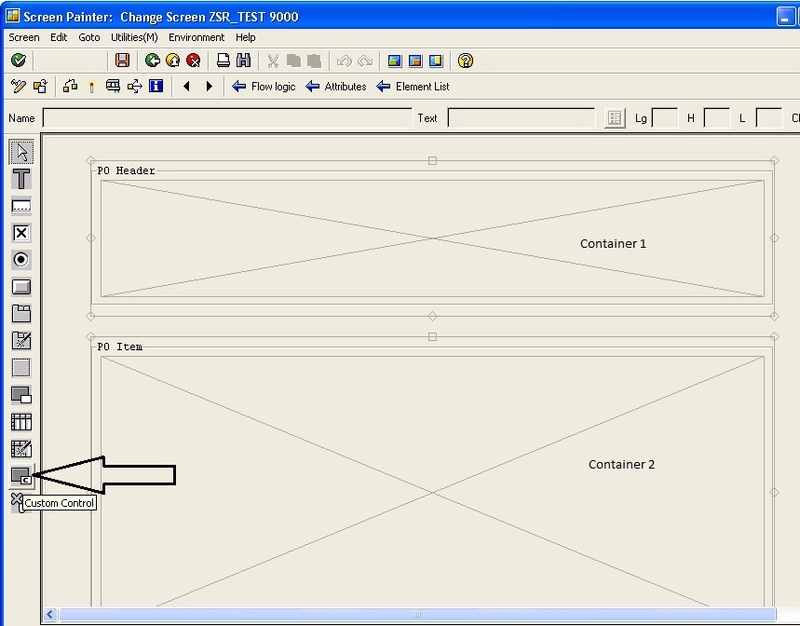 The Screen Painter will appear and you have to draw a Custom Container in the screen. Create the Screen Before creating a screen, you need a program to be created so that a screen corresponding to the program can be created later. You logic is perfect. Hope this destroys our inhibition of using Splitter Containers and Tree Models on the same call and meet the second objective of this tutorial. But PBO runs again and again whenever an action takes place in the screen, whereas we want to load and display the table only the first time the scree loads. Subroutine to fetch basic data for tree model Step — VII: Selection Screen Step — VI: If I have a 3 or 4 level hierarchy, Can this example fulfill my requirement. Splitter containers are well explored but hardly used unless we have such specific requirements. For one client requirement, we had to build a report with splitter containers along with tree structure. Uisng is very well possible if you want uxing do so. Go to SE51 and create a screen with screen number Do we need to create two containers? The trust part comes later” from the film Man of Steel. We want our articles to reach to as many audiences as possible so that everyone would benefit and our team would remain motivated and our work does not get lost in this huge ocean of the internet. Tree structures can also be done in many other ways. It is as simple as that! Do post your comments if you have tried successfully. Hello Dev, If I got you correctly, you want to make the left pane tree hierarchy to be extended to 3 or 4 level which in this example is expanded to 2 levels. I mean can we have a tree displayed even if the 4 levels in the tree and not connected to each other via database tables? We put a lot of effort in conceptualizing, testing and writing each and every article. Before creating a screen, you need a program to be created so that a screen corresponding to the program can be created later. Hi Saswata, Do you have example of further this demo. You are usint Praveen. Objective is to establish a connection so that you can make the folder structures accordingly. If you do not have a database connection between those tables, conceptually you should have built a set of tables or your available tables should have some connection among them already. Plenty of documents is available over the internet. Personally I prefer macros to do this kind of repeated work, so that its easy to code and the code looks very neat and understandable. But thanks to Author Saswata, he made it look simpler than I thought. Now the screen is ready, but you have to specify what code should be executed during the PBO and PAI events of the screen. Do you have example of further this demo. Oips combination of these two might sound difficult but actually, these are quite easy to handle.